In the coca heartland of Bolivia, slavery and liberation are still matters of living memory. In this half-hour film, we visit the town of Tocaña, where African descendents worked as slaves until 1952, and local people still perform dances rooted in their African cultural heritage. 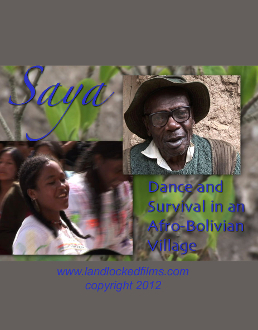 The “Saya” dance troupe performs in the plaza of a nearby tourist town before an audience of local Indians, rich weekender from the Bolivian capital of La Paz, and international tourists. The film highlights the dilemmas of cultural survival and emergence for an endangered subculture in an era of global saturation.